Are you crunched for time, on a tight budget or just starving for healthy meal ideas? You will find delicious, healthy choices for you and your family at SkinnyMs.com. Skinny Ms. offers recipes made with natural, whole food ingredients. At Skinny Ms., we are devoted to providing information and tools that empower one to make choices beneficial to living a healthy lifestyle. For our latest recipes, join us on Facebook. If you are a quinoa hold out but love Mexican food, this dish will convince to make quinoa a regular part of your dinner menu. 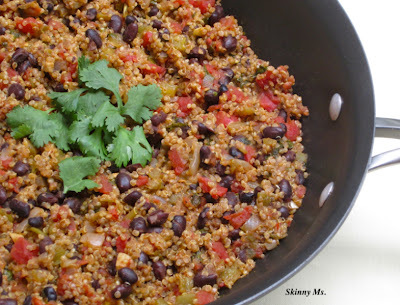 Skinny Quinoa with Black Beans is gluten free and vegetarian friendly. In a large skillet add olive oil, turn to medium-low heat and sauté diced onions until tender, about 4 minutes, add garlic and sauté one additional minute. Add the remaining ingredients in the order listed above. Cover, bring to a boil, reduce heat to a low boil and cook 15-20 minutes or until liquid is absorbed. Remove from heat and allow it to sit 5 minutes covered before serving. Fluff quinoa with a large spoon and serve. I guess quinoa is the new power food. How does it taste? This recipe is great to help lower my cholesterol; it has 7 grams of fiber per serving.